Once you have put screws into dressed timber (dressed timber is smooth finished timber that is best stained or vanished) you are left with the ugly head of the screw showing. How do you get the natural lines of the timber back? You can use colour matched timber putty, but to be honest, timber putty always looks like timber putty. The best alternative is timber plugs. What are timber plugs? Timber plugs are cylinders of timber (as shown in the picture) cut out of timber using a plug cutter (a type of drill bit). When you cut your dressed timber, keep a piece of the off cut to use for cutting your plugs out of (what I do is keep an off cut of every piece of dressed timber, so this way I can match the timber plug exactly with each piece of timber). When you install your dressed timber you need to get a spade bit (a type of drill bit) that is the same size as your plug cutter. This is so you can counter sink the head of the screws by 4-6mm using that spade bit, that when you install your plugs they will fit nice and tight in the counter sunk screw hole. Glue in your plugs insuring that the glue goes around all the edges of timber plug and the timber grain on the plug follows the same direction as the grain on the dressed timber. Once the glue has tried come back and with a sharp chisel, cut the top of the plug off, leaving it about 0.5mm high. From here get some sand paper and sand the remainder of the timber plug flush with the dressed timber. Now you are ready to vanish/stain your timber. Using timber plugs takes a little more time to do than using timber putty. The difference between timber plugs and timber putty is massive, and will make all the difference in making your deck look a million dollars. Termite protection for your deck is not only a legal requirement, it is the only way to save your home and yourself from the heartache that termites bring with them. Most decks are connected to a house, which makes your deck the perfect entrance for termites into your home. So we are going to look at a one of the few different types of termite protection systems that the “Building Code of Australia Volume 2 (Section 3.1.3 Termite Risk Management)” require as a minimum for termite protection. A visual termite barrier is where the termites make their trail up the outside of the non-timber products so that you are able to see the termite trail. The minimum distance a termite visual barrier needs to be is 75mm. For example, if you are planning to have garden around your deck, your deck posts need to be kept a minimum of 75mm above the top of the garden so you can see the termites making a trail up to your deck posts. When you can see the termite trail, DO NOT touch or disturb them, call you local pest controller. If you do disturb the termites they will leave that trail into your home and find a new way in. The way most termite baits work is the termites eat it, go back to the main nest where they die, the other termites eat the poisoned termite and the cycle continues. To find out how to create a visual barrier for your deck you will need to purchase your copy of the “Digging and Installing Footings” guide. Although it is fairly easy to calculate floor joist centres, it is just as easy to mess it up! I know I still do. Start by measuring the full length of your deck (outside of bearer to outside of bearer) and then subtract the thickness of one of the floor joists. Then divide this measurement by the maximum floor joist spacing that is mentioned on your drawings. Remember to complete all calculations using millimetres. Now your final answer is almost never a round number. No matter how small the decimal amount, you should always round up to the next whole number. 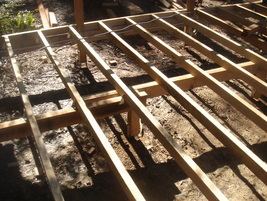 By rounding up you add an extra floor joist to your deck, which decreases the size of your floor joist spacings. This in turn ensures your deck complies with your approved deck plans (To read some example disasters where DIYers have not complied, download your free copy of the “15 Common Deck Construction Mistakes“). The final rounded up number you are left with is the amount of floor joist spaces and if you add one to this number you have the number of floor joists required (this is of course, if you don’t have any double floor joists. If you do, we will cover what needs to be done in another blog). The next step required is to calculate the formula for the actual floor joist spacing/centre measurement that ensures all your floor joists are equally spaced apart. Remember to complete all calculations using millimetres. Once you have the results of both these calculations, you are ready to mark out and install your floor joists. For more information please contact us with your questions. What is a platform deck? 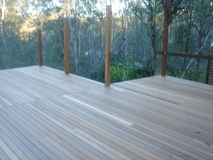 A platform deck is a free-standing deck, often referred to as a floating deck, which is not connected to a structure, such as a house or building. 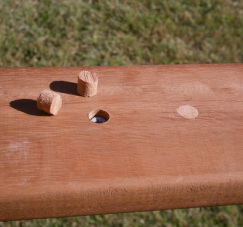 To build a floating deck the conventional pole plate/ledger board (see “Deck building terminology”) is replaced with an additional set of bearers and posts. So why would you build a free-standing deck? If you are leasing a property and you need to remove the deck at the end of your lease, a floating deck is a great option, because at no point during the construction do you screw/nail or fix the deck to the building. Or if your home is on stumps that are set back from the outside of your home, a floating deck would be much more practical because you don’t need a pole plate to support one end of your deck. What are the differences when it comes to construction? When it comes to building a platform/floating deck the only real differences are the requirements for a few additional posts and bearers and the need to ensure that no fixings (nails, screws, etc.) are used to connect the deck the building. Otherwise it can be built in the same way as any other deck. For detailed guides on how to successfully build a deck, connected or floating, you can purchase our complete set of guides (“All Available Guides”) from the Resource Shop. How do you make a ‘rough sawn’ (see building terminology) timber post look good? There are many ways to do this, ranging from elaborate detailing to the simple ‘leave it as it is’ approach. Do you want to know how the professionals achieve great results? In the simplest of cases, we run an electric planer over all the corners of the post to give them a bevel. Two things happen when you do this: firstly, you remove all the splinters and furry bits from the corners of the post. This makes the post a lot safer and much more attractive. Secondly, the sharpness of your timber post’s bevelled edges will fade after a week, giving it a natural look. It will look as if the bevelled edges were always there. As a finishing touch, we use a hand plane to run around the base of the post (as shown above) to remove any splinters. 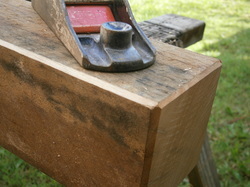 A hand plane is used rather than an electric planer to keep from chipping the corners of the post. While you may have never noticed these sorts of little details before, it is this attention to detail that ensures your deck looks professional rather than amateur. Cutting your decking boards neatly around posts.